Vietnam's garment and textile industry has set an ambitious target of 13 billion USD in export earnings for this year, according to the Vietnam National Textile and Garment Group (Vinatex). The General Statistics Office reports that garment and textile exports in December passed 1.15 billion USD, bringing the total export turnover of the industry in 2010 to 11.17 billion USD, a 23.2-percent increased over 2009. To achieve the target for 2011, the sector will focus on maintaining current customers and instructing makers to seek out new markets and customers, Vu Duc Giang, chairman of Vinatex, told online newspaper VietnamPlus. The sector will also raise its localisation ratio to between 55 and 60 percent in 2011. In July polyester manufacturers are expected to turn out the first products in the country with 80-90 percent domestically sourced polyester thread, reducing reliance on imports. Giang added that cotton growing remains problematic for the local garment and textile industry. Vietnam is a country with a large population and not much land and dóe not have a comprehensive policy to develop industrial crops for industrial sector. Giang said Vinatex is currently working with provinces to encourage farmers to alternate cotton plants with other crops. He said it will be difficult to develop a cotton growing industry that met the requirement of the garment and textile industry, because of poor soil quality and small cotton farming area. Vinatex is preparing to establish a raw material manufacturing joint stock company with its member companies to work with provinces to earmark farm land for cotton growing. It is looking for farmland ranging in size from 50 to 100ha. 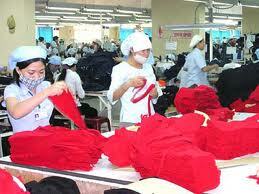 Domestic garment and textile production was expected to achieve growth of between 18 and 22 percent in 22 percent in 2010./.